The organ originally came from the Regal/ABC Derby and was opened on 27th June 1938 by Wilfred Southworth. The original organ comprised 3 manuals, 6 ranks of pipes and a Melotone attachment. 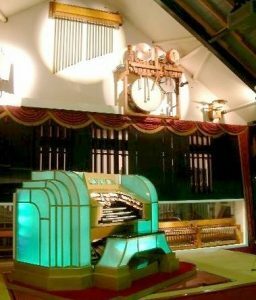 In 1965, the organ was removed from the cinema and sold for £300 and installed in a private residence in Castle Donnington. In 1990 the organ was bought by David Thorpe owner of Dovedale garage. The organ was carefully removed and put into storage at the garage. Over the next ten years the organ underwent a complete restoration and during this time the showroom was built to house both cars and the Compton. The organ had various ranks added plus effects such as Chimes and Vibraphone. Unfortunately the organ no longer has a Melotone unit. The design of the installation provides the audience with full view of every part of the organ with the traps (effects) and Piano positioned around the stage. The chamber is fitted with 6mm thick specially made glass panels so that the pipes can all be seen. The console with its illuminated surround sits on a turntable lift, which came from the Odeon Birmingham. The lift rotates through 45-degrees and is probably the only working example in the UK. The organ, which had not been heard for some 35 years was finally re-opened on the 3rd October 1999 by Stephen Foulkes and consisted of 9 ranks. Since then further ranks have been added along with effects and a piano accordion. Stephen is now the resident organist at ‘Pipes In The Peaks’.